Prima Strings is YOBC’s entry-level string ensemble. It is geared toward elementary/early middle school students who have limited or no ensemble experience and who are still mastering their instruments. 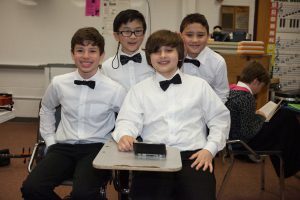 Prima Strings presents three primary objectives to its members: to introduce and foster the technique of ensemble playing, to continue to develop each student’s individual technique on his or her instrument, and to expose each student to a breadth of musically valuable literature from various periods, regions, and cultural traditions.